BRcade is a battle royale forum game for any number of players. It should span roughly 10-14 days and requires each player to send one PM a day. Sign ups are open now for the game to begin the evening of Monday 23rd July. Post below to sign up, and read on to learn how it works. The objective of the game is to be the last person standing, in battle royale style. Every day after the daily update is posted in the thread, all players will receive their individual PM update. This will state the result of the previous day's action (and any actions affecting the player). It will also include the player's status (health, inventory, location) and let the player know who else is on the same tile. Players should respond to this with their chosen action for the day, out of moving, looting, attacking (with weapon choice if relevant), or using an item from their inventory. Please send your action as the PM subject. This way I don't have to click into every PM individually so things will be easier as host! After I have resolved the day's play (the order of action resolution will be randomised), I will post a daily update in the thread. This will show the current map, indicating when the play area will shrink, as well as listing any and all kills that happened. From this everyone can see who has killed who and with what weapon. All other information is secret, although players are free to chat in thread and reveal any information they would like. The game begins on a 7x7 grid. After every third day this will shrink from the outer edge, forcing people towards the centre. The map size thus progresses 7x7 -> 5x5 -> 3x3 -> 1x1. That means by day 10 everyone remaining will fight it out on the final square. The daily updates will include an updated map for easy visualisation. If you get caught by the shrinking grid, you lose 1 health and have to move in on your next action. You cannot move out of the shrunken grid. Named locations have more loot than blank tiles. Once you have signed up to play you can send me a PM to choose which tile you want to start on. If I don't receive a PM by the time the game begins your start location will be randomised - I strongly recommend picking a location. Moving simply lets the player move to any adjacent tile, including diagonals. Attacking is available if there are other players on the same tile. The player chooses a target, and if they have a weapon they can choose what to use to attack. Each player starts with 3 health, and the damage done depends on the weapon used. The base damage for melee (i.e. not using a weapon) is 1. Looting will net the player a random item for their inventory, and depletes the loot available on the tile. Tile resources get depleted and the current loot availability is declared in the PM update, so players can't loot a depleted tile. Dead players can also be looted for their entire inventory. If not action is received by PM, the player will do nothing, in effect wasting the turn. Pistol - Attack for 2 damage, has 3 shots. Shotgun - Attack for 3 damage, has 2 shots. Sniper Rifle - Deals 3 damage, has 1 shot. The rifle can be used to attack at close range or the player can choose an adjacent tile to aim at. If there is a player in that tile they will attack them, if not then nothing happens. Medkit - Heals 2 damage (to the max of 3 health), one use only. Armour - Gives an extra 2 defence, one use only. Effect does not stack. Can I team up with others? There can only be one winner in BRcade, but how you get there is up to you. You're welcome to play the game however you wish. I'm dead or not playing, can I comment in the thread? Please do - in fact I encourage it! With play happening via PM the thread could be quiet, and I'd rather it wasn't just a series of daily updates with no comments in between. The only rule if you're dead is that you can't give away your killer's location. Just post below, and then send me a PM with your chosen starting coordinates. I'm not going to be very active between this Wednesday and the game beginning next Monday night, so don't worry that I haven't confirmed you're in - anyone who signs up will get to play. 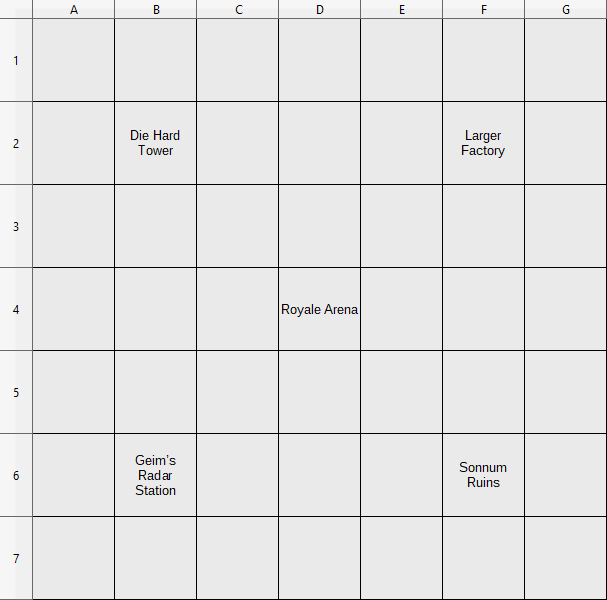 I want to start on whichever grid square represents the stool that Stool Bloke sits on. Skimmed the rules, have no idea what is involved. I haven't played a forum game in ages, but this one at least seems relatively straightforward. In!